As a backyard naturalist and river enthusiast, Henry David Thoreau was keenly aware of the way humans had altered the waterways and meadows of his beloved Concord River Valley. And he recognized that he himself―a land surveyor by trade―was complicit in these transformations. 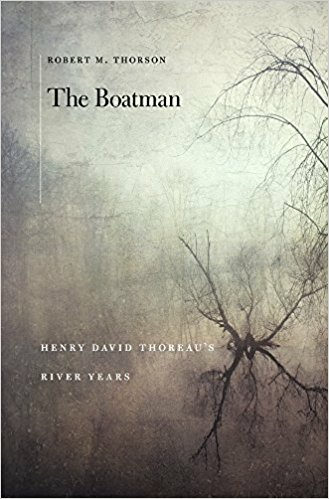 In The Boatman: Henry David Thoreau’s River Years, Robert Thorson narrates Thoreau’s progress from anger, to lament, to acceptance of the way humans had changed the river that he cherished more than Walden Pond. By the mid-1850s Thoreau had come to realize that humans and an “imperfect” nature were inseparable. His beliefs and scientific understanding of the river would be challenged again when he was hired in 1859 as a technical consultant for the River Meadow Association, in America’s first statewide case for dam removal―a veritable class-action suit of more than five hundred petitioners that pitted local farmers against industrialists. In the years after the publication of Walden in 1854, the river boatman’s joy in the natural world was undiminished by the prospect of environmental change. Increasingly, he sought out those river sites most dramatically altered by human invention and intervention for solace and pleasure ―for better and worse. A scrupulous account of the environment Thoreau loved most and, important for our day, the ways in which he expressed this passion in the face of ecological degradation…Thorson argues convincingly―sometimes beautifully―that Thoreau’s thinking and writing were integrally connected to paddling and sailing…With the meticulous care of a modern geologist, he excavates Thoreau’s journals, notebooks and correspondence, concentrating on the last years of the naturalist’s life and exposing the way he became what today we would call a fluvial geomorphologist, an environmental scientist devoted to understanding the form and function of rivers. Thorson’s book offers the reader an in-depth account of Thoreau’s lifelong love of boats, his skill as a navigator, his intimate knowledge of the waterways around Concord, and his extensive survey of the Concord River.